A classically beautiful bouquet of roses. Have you ever wondered why brides carry bouquets at their wedding? In ancient times, strong smelling herbs and spices were thought to ward off evil spirits. Today, wedding bouquets are used as more of an aesthetic purpose. Flowers can easily become a huge part of a wedding budget, and much like fashion – flowers go through trends. Depending on the style of the wedding, you may see tons of flowers or just a few. Bouquets will usually be carried by the bride and her attendants, while the groom and his attendants wear boutonnieres. Bouquets can be as large or as small as desired. Some brides may choose a small bouquet; while others may choose a dramatic, cascading one that is full of beautiful blooms and greenery. There is no set of rules for what types of flowers to include in wedding bouquets and other floral arrangements. Most brides will customize their flower choices to match the colors of their wedding. You can even customize flower colors by their meaning! 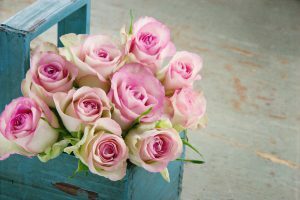 Roses come in colors of all kinds, but some brides may use other flowers such as hydrangeas or peonies. Adding succulents to bouquets has become a popular trend in wedding floral design. Over the last year, wedding floral trends have developed to adapt more than just roses and babies breath. We have seen brides use unusual and unique things such as eucalyptus, magnolia leaves, and even succulents! Some brides have even opted out of floral bouquets and choose to use a bouquet of feathers or ribbon. Lately, succulents have made a big impact in wedding trends. 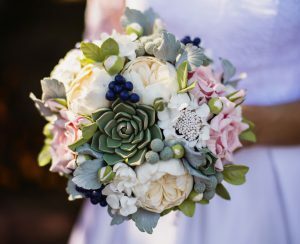 Some brides have even made bouquets entirely out of succulents! These have become a trendy plant due to their variety and durability. Succulents also come in a variety of colors such a green, purple, and blue! Wedding bouquets can be kept and preserved after the wedding. If succulents are used, they can be removed from the bouquet and used in a terrarium inside the couple’s new home – what a wonderful keepsake from the wedding day! For more rose & flower inspiration, you can visit our Pinterest Page!